This article was originally published on the green building channel of our sister site, Charles & Hudson. Written by Tabatha Muntzinger who is a mother of two and always striving to create green spaces for her children. 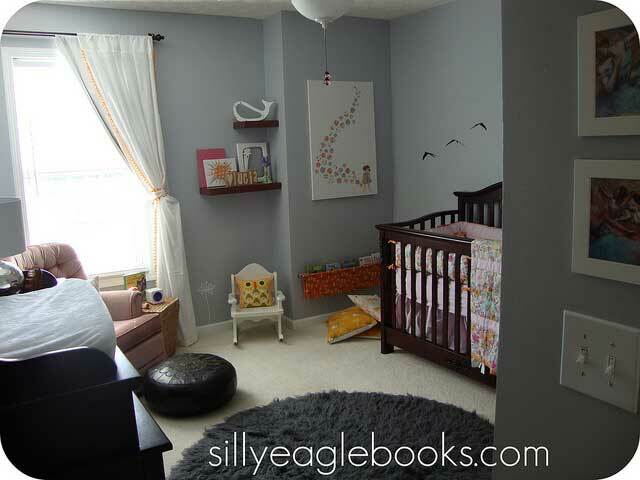 One of the most frought-over spaces in this category is a child’s room. Chances are, at some point, you may be converting some space in your home to accommodate a little person, and with the plethora of baby and kids focused products out there, it can be really hard to make the greenest choices as it applies to your house and the room. The three things that I think are imperative to a fully-functional kids room are ease of use, clean-ability, and long-term functionality. When setting up a room for a baby or child, you not only have to think about what looks cute, but the actual ease with which you can navigate the space. You will be in there at all hours with hungry/sick/tired little people, and something like an ill-placed rocker or hidden changing station can really but a cramp in you and your little one’s sleep schedule. Once you discern what’s going to work best for your family, don’t be afraid to re-use hand-me-downs, peruse Ebay and Craigslist, and venture out to consignment stores. A great deal of baby items are short-lived in their usefulness, therefore in great shape with plenty of life left in them. Just make sure you check for any safety recalls, especially for furniture like cribs, high chairs, and strollers. That way you’re keeping large items out of landfills and saving money at the same time. I’m all about the green cleaners, and I was more than excited to find out that anti-bacterial ones are being developed. However, while setting up an Amazon wish list for the newest little bundle of joy on the way, I was intrigued to find a company making organic, enviro-friendly cleaners meant for kids’ toys. I haven’t been able to try it yet, but I think it’s a fabulous idea. After watching my son scoot around in the dirt and gross and construction debris with his toys and then stick them in his mouth, I totally understand the desire for a toy cleaner. Not everything can be easily washed off in the sink or washing machine (I’m looking at you, eco-friendly wood and bamboo toys) and adding one more cleaner to my aresenal that’s both safe for my family and the environment gives me a little more piece of mind. Lots of kids things on the market these days are single-purpose for one brief phase of development, and then you’re supposed to buy something else for the next step. However, you can find things that can grow with your child, and you can take the initiative to make sure the space you’re setting up is meant to grow as well. Look into cribs that can convert into toddler beds (or even a headboard for twin or full sized mattresses) and changing stations that can become armories or dressers. Even simpler yet, if you’re making a space for a first child and anticipate the pitter patter of little siblings in the coming years, buy things with the intent of using them for all of your kids. Look into more gender-neutral colors for the space and accessories so you can really get a good life out of them. Think about the possibility of the space being shared by multiple children, and think about how it will convert simply from a nursery to a toddler’s to a child’s room without much waste. Make the room as flexible with storage as possible so that as your child grows, your child’s room will simply and cheaply do the same. What about those of you who’ve had to make room for a little one? How did you make the space green on the cheap? Let us know in the comments, and stick around for the next installment of the series, where we’ll tackle office spaces.